I love a little lip product. Clearly. I have probably about 100, I haven’t actually counted but its safe to say thats the number. It can be a problem. 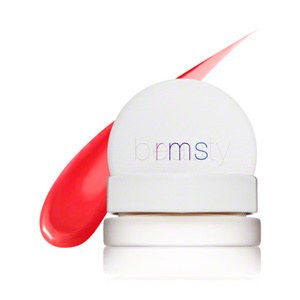 I love RMS Beauty, really great colors and formulas and super non-toxic which I really love. But their lip products were always lacking in brightness, too often I found them to have brownish undertones. All of them. That was until RMS Sacred, which is pretty much the perfect pinky-red. The color reminds me of fruit punch. Even though its bright in the pot, on your lips its much more subtle and laid back. There is no high shine so you don’t have to worry about your hair getting stuck to your lips. The color is really spot on and flattering. If you are looking for a natural and bright lip color really look no further RMS Sacred nails it.